Starting immediately where last issue left off, the White Martian lunges off its platform at Batman and John Jones. John shapeshifts back into his Martian Manhunter form as Batman tells him to keep the White Martian busy and zips to the platform above. John then, while fighting the creature, has a telepathic conversation with the White Martian about J'onn being a "murderer". John continues to insist that he is a protector and not a killer and that the only reason he killed White Martians in the past was because they were at war, something he has long since regretted. At this time, Batman finds the Martian's "nest" and finds Faraday's key-card with a picture clipped to its back. Batman then interrupts the fight between the two martians and it's revealed that Faraday had a daughter and because of that loss, he bonded with the White Martian over their loss. John then goes into the Martian's mind and sees her memories. We see how she was sent away during the Martian Civil War, we see her landing on Earth and being found by Faraday, and we see how she shapeshifted into Faraday's daughter to help him grieve. The Martian then says that she decided to act when she felt the presence of another martian mind being activated when Dr. Fate helped John get his powers back before also revealing her real name, M'gann M'orzz. Batman disarms his weapons and John proceeds to comfort M'gann. Later at the Batcave, Barbara has fully recovered from her injuries at M'gann's hand and Bruce explains to her how the conflict ended. Bruce and Barbara begin to train in the Cave once again, with Alfred smiling at the sight. Back in Metropolis, John and his "niece" Megan go back to his apartment and as it turns out, Superman had come by and fixed all the damage John and Megan caused. After talking to his neighbor, John and Megan fly away. Once alone in space, John and Megan shift into their natural martian forms of J'onn J'onzz and M'gann M'orzz and fly off to Mars to learn more about their family history. Story - 5: Again, I give "Effigy" a 5 this week as well. Last week's chapter was all about covering Smallville's Martian Manhunter's origin for this universe, and I think that helped set up this week's finale. However, this week was a bit of an origin for M'gann, but also included a good fight, good closure with Batman and John (and their protégés), and gave us hope that we'll see these characters again soon. Now, I have a lot to say about this chapter, but let me start with the basic one that everyone reading knows I'm happy about: the White Martian is Miss Martian! Yay! At the time I'm writing this review, Young Justice: Invasion just finished airing on the West Coast and it reminded me of how much I enjoy the character. I'm very glad that J'onn now has someone he can confide in, talk to, and someone who completely understands his loss and pain, as well as now being able to help someone else through their own pain. I think, and most continuities don't follow this, but I really believe that J'onn J'onzz needs a protégé, not because he needs a sidekick, but he needs that person who understands him and who he can help through their own issues, and I think this story did a good job of establishing that for this universe. On that note, I would like to say that I want Miss Martian to possibly be involved in a Teen Titans or Young Justice team in the future, along with Superboy, Nightwing, possibly Stargirl, Blue Beetle, the Wonder Twins, and a few more young heroes that Smallville could band together. I think that would be really cool and I think that because of "Effigy," she needs to understand humans and build a life among them instead of just isolating herself on Mars or in Checkmate. It would be good for her character and would be fun to see all of Smallville's younger heroes (who are not Justice League members already) teaming-up to face "fill-in-the-blank villain" and help each other through their own issues. 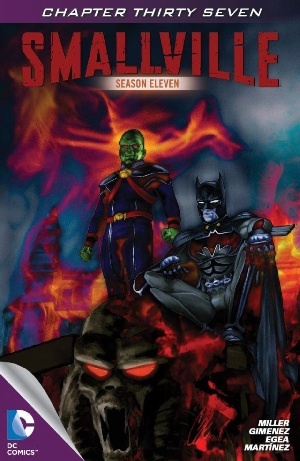 But moving on from my favorite revelation, I would like to say that I really enjoy the Batman/Martian Manhunter partnership that Bryan Q. Miller brings to the Smallville Universe. It was neat to see them side-by-side in "Effigy" and it was nice to see them trust each other, after their fight in the Batcave of course. I have always felt, ever since watching Justice League as a kid or watching "Justice League: The New Frontier" that Batman and J'onn could easily team up, as they think very much alike and are willing to do more than most to further their cause or mission. That is why I liked how Batman reacted to J'onn and his situation with M'gann, because he knows that 1). They think alike and if J'onn says M'gann is okay, she's okay, and 2). If something goes wrong, J'onn will stop it. I mean, for goodness sake's, both J'onn and Batman in the comics (mainly during the 1990s) had contingency plans against the entire Justice League that could stop them in case they went rouge. Again, this is why I like this team-up and this is why I think Bryan did such an amazing job with this story. Other things I liked from this chapter include the "Legends" panel (Part-2 of the "Absolute Justice" event from Season 9) where J'onn gets his powers back from Dr. Fate after losing them in "Odyssey". Interesting way to connect that with M'gann. I liked the training scene between Bruce and Barbara at the end, with Alfred in the background. I think Alfred likes that Bruce is finally becoming a "dad" so-to-speak to someone, just as he was to Bruce. And I cannot forget the shot we see at the end of the moon and of the Watchtower being built on it. It looks a lot like the Watchtower in Metropolis to me, which I don't know if I like or not but we'll see how it goes. Thank you all for reading my thoughts on "Effigy" over the last three chapters of the arc (as Marc did Part 1) as it had been a blast to review them! Don't worry, Marc will be back next week for "Haunted, Part 10" and will stay on through Part 12. After that I will return to review the next parallel story "Valkyrie," which sounds like an all-female hero's story. I honestly cannot wait; I am expecting it to be a fun read. Also, don't forget to buy the "Smallville: Season 11 Special #1" on May 29th for the complete collection of "Effigy" in hard-copy, print format. My preferred comic book experience. Until next time guys! Art - 5: Again, Gimenez does not disappoint. I love his drawing of J'onn in human form, in martian form with human cloths, and finally in his Martian Manhunter form at the end. I also really like the way he redesigned M'gann to be in her Miss Martian suit once she accepted J'onn and became a "hero". He also did a lovely job with Barbara and Alfred at the end, and like always, I love the way he draws Smallville Batman.